Few categories get as much interest as the “dogs” category in the Guinness Book of World Records. And there are some truly amazing dogs out there. Like Zeus, the Great Dane who holds the world record for World’s Tallest Dog and stood at 44 inches in height. Zeus passed away last year, but still holds the record. Well a new contender for the World’s Tallest Living Dog is trying to stretch into the books. Bentley, a Great Dane from Pennsylvania stands at an impressive 38 inches tall. Although he’s not quite at Zeus’s height, he may be the tallest dog alive today. Bentley’s owner won’t find out if the pup made it into the record book right away. The verification and measuring process is very involved and includes sending vet records and photos. There’s also the challenge of getting an accurate measurement. When Zeus’s owners tried to measure him, he was afraid of the measuring tape. 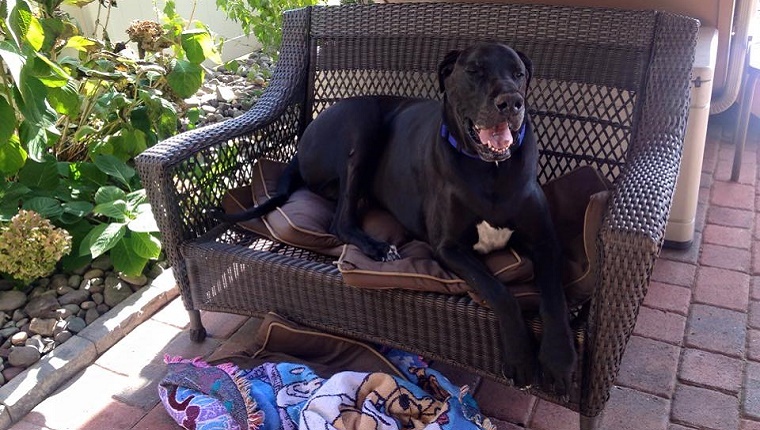 Bentley’s owners describe him as a big lap dog, and it’s not uncommon for Great Danes to be called the biggest lap dogs in the world. Good luck, Bentley. Maybe we’ll see you in the record book.